Last year, I wrote an article for LinkedIn on How to Build A List of Target Companies, which outlined some ways you can tap into the hidden job market and find unadvertised job opportunities. Inspired by my colleagues to expand on this article, I’d like to provide you with 20 creative ways to build your target list so you can find your own job leads and not be dependent on third-party recruiters and job boards. These are proven steps you can start using immediately. I’ve used these tactics personally to build target lists for my current clients in my job search practice, as well as when I built a recruitment practice in earlier in my career. If you’re going to conduct a job search, you might as well think big, right? Think about what is it about these companies that inspires you to work for them. When writing down these traits, use them to springboard your thinking to come up with other companies that seem to embody those same traits and philosophies. What is the CAVACTM Model? The CAVACTM Model is a methodical, hub-and-spoke thought process that helps job seekers create a stream of new ideas pertaining to potential companies where they may find their next position. The Cs are the company’s clients and competitors, the V is vendors and the As are associations and affiliate companies that compliment the target company’s business. For each company on your initial wish list, place the employer or target company’s name in the middle of the diagram below. Then write out the clients, associations, affiliates, competitors and clients that come to mind and from your research to expand your list. Each company listed can be a possible entry on your developed target list. Now for each company in the CAVACTM sections, take a blank CAVACTM template and create a new diagram for each of the companies, from the outer circles to the center circle. For instance, put Bullhorn, the Applicant Tracking System vendor, into the center of one diagram as a target company, then research who are its competitors, associations, vendors, affiliates and clients. This exercise can go on and on with each new diagram, ensuring you’re never short on target companies. Ideally, if you can attend a conference live, that’s always best, as it will enable you to network and start (or nurture) relationships with people who can help your job search and, ultimately, your career. However, practically speaking, if you’re unable to attend an event, review the website/conference literature for more information. Look the speaker list — who does each speaker work for? Review the sponsor list — who’s committing advertising dollars to this conference? These are companies that, by the nature of funding speaker travel and sponsorships, typically will have the philosophy and long strategic view to growth and leadership you may be looking for, which means they could be great candidates for your target list. The key here is to be sure you’re surrounding yourself with positive, action-driven, generosity-minded people who will exchange job leads equally based on the needs of each person in the group. These groups can be found regionally online with state unemployment offices or on private websites such as The Landing Expert, which has an updated list of New Jersey job search clubs and gives meeting times, dates and locations. When identifying blogs in your industry, there are a few ways you can use this information. Hone in on companies that meet your company size and industry, as well as revenue and employee size targets. Zoominfo.com, Jigsaw.com, Spoke.com and Hoovers.com are all database lead companies that provide contact lists from companies where you might want to work. Whether you’d like to work for a newly formed firm, a firm in its high growth stages or a firm fueled by private equity or venture capital funds, review publications like Merger & Acquisition Magazine or The Deal Pipeline. You can also access information in niche databases, such as the Mid-Atlantic Venture Capital and Private Equity Directory, as suggested by my colleague Phil Dubinsky, CEO of Thoroughbred Private Equity Partners. …Especially if you’re looking to have a short commute and focus on quality of life. I’ve done this in my own neighborhood and, while I was very knowledgeable about companies hiring in NYC (where I worked at the time), I was amazed by all the search firms right down the block from me and in close proximity of my home in Northern New Jersey. I find over and over again that job seekers are amazed to find a major company has a field office or secondary presence in their town that they never knew of because they were only aware of the location of the corporate headquarters. Go with what you know and what you’re familiar with. Every company you encounter in your daily life could be a possible lead, depending on what you do. After all, if you’re a VP of Human Resources, human resources is a function in, well, every organization. Let’s be clear: Whether or not a position exists, every company has someone doing an HR function. So use the obvious, available information in front of you to research whether the company is a viable target company list item. For instance, you may have a local brewing company in your county. If you come from a food packaging/distribution/production background or have a hospitality/restaurant background, having your favorite brewery as a target company (and eventually your employer) could be an awesome thing. For example, I have a client who simply told her hairdresser she was looking for as an administrative manager position, ideally in a creative organization, to appeal to her artistic side. The hairdresser had another client who she knew worked for a major publishing firm as a merchandising executive — who happened to be looking for an administrative management professional. The hairdresser made the introduction to the company (which fit my friend’s company profile but was not initially on her target list — new target company discovered!). Fast-forward two to three weeks later, and she has the job. Attend and consider joining your area’s local business association partnerships, Chambers of Commerce and other business-embracing organizations in your city and county. Employers in your area will attend these meetings, and you can meet your area’s local employment players in person. Subscribe to the alumni magazine. When I receive Cornell University’s Alumni Magazine, I highlight notes in the articles and class notes of where people moved to professionally to come up with ideas for job leads for my clients. These publication are meant to be a “who’s who” and “who’s where” to be leveraged in a proper manner (no spamming, of course). For any industry, alumni, mainstream or professional publication (online or print), make note of the advertisers in that publication. If you’re a CFO in the pharmaceutical industry, the advertisers in a pharma industry publication could be packaging companies, labeling manufacturers, professional development firms, drug security/counterfeit drug prevention firms and drug distribution firms, who all who need a CFO and may be interested in your experience from the perspective at a company within their CAVACTM network. This is a great way to find new companies and new industries. For instance, if you’re a business development manager or VP of Sales and Marketing for an electronics firm, look at your CAVACTM network, reach out to select people you trust within that network and find out who is calling them. Who is pitching services to them? These organizations are all leads, either to idea generation that will lead you to an open role or to an actual open role. Review their profiles. Where did they work previously? What’s going on with that previous employer now? Ask yourself if those companies are worthy to be on your target list. To take an extra step with this information, if you’re within three degrees of this target company’s former employee, consider asking for an introduction to determine if you can obtain any information about the hiring process. Some say applying to online job boards can be futile, and I don’t disagree. However, online job postings are an indicator of who’s hiring. So if you discover a great company through an online job posting, but it’s not the right job for you, use it as evidence that the company is hiring. If a company is hiring sales managers, consider approaching them, outlining how you’re an exceptional client service director and correlating how your accomplishments can become an asset to them. Don’t wait for the job opening to become available; use what’s there to craft your own proposal. Do Google searches and set up Google Alerts for terms like “downsized” (this is an important term to search for if you’re looking for consulting work), “hiring staff” and “expanding operations,” combined with your zip code and/or industry, to unearth companies in the news that are doing these activities. This indicates these companies are ripe for new perspectives and additional talent to execute the plan at hand. This includes sites such as CNBC, Marketwatch, The Wall Street Journal and Financial Times. Research companies of interest in the articles (and the advertisements!) to determine which of the new companies you discover should be on your target list. Look at where your fellow students work. Based on the information they share about their employer in case studies and lab work, does it give you a warm and fuzzy feeling? Would you want to work there? This list is not exhaustive, but it’s a great start if you’re looking to find your dream job. It’s also yet another lesson that information can always be updated, improved and presented in a more effective way to ensure you, the job seeker, have the most current, practical tactics to persevere in your job search. Best wishes as you build your target list! 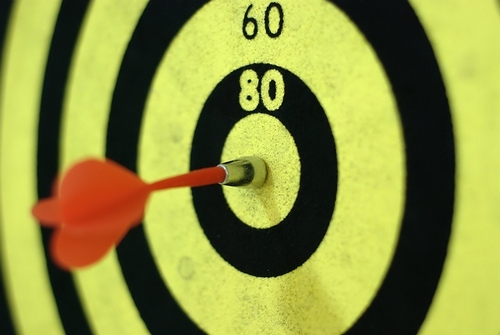 Where can you start to begin building your target list today? Share your your own tips in the comments! How Many Pages Should My Executive Resume Be?